Anna Kincade likes it quiet when she knits a design onto a baby burial blanket. "Having the TV on is too distracting when you are counting stitches," Kincade said Monday as she sat knitting in the Infants Remembered In Silence office. Her current project entails knitting an afghan with a heart pattern. She finds it a challenge, having to rip out rows of stitches from time to time. She hopes, however, the grieving parents who receive the blanket will have their sorrow eased by the stitched hearts wrapped around the infant they bury. "I've received some letters from parents thanking me. It's felt so good to be able to help someone going through such a painful loss," Kincade said. IRIS -- a nonprofit group that offers support and resources to families who lose a baby in pregnancy, stillbirth or early infancy death -- was founded 19 years ago by Diana Sundwall of Faribault after she and her husband, Mark, dealt with the loss of their son from a full-term stillbirth. "IRIS now has over 300 volunteers within the six-county area that the organization serves. The area includes Rice and Steele counties," Sundwall said. "About 100 of those volunteers knit or crochet burial blankets and hats. Several sew burial gowns." A burial package of a blanket, gown and hat are put together in various colors and sizes and given free of charge to grieving parents as part of IRIS's services. Sherry Lee sews burial gowns for IRIS in various sizes. The outfits, while as small as doll clothes, are specially designed to fit tiny infants lost in pregnancy or stillbirth. Some are also in larger sizes for infants who died from an illness or accident. "I started doing it because I had a loss of child in pregnancy quite a number of years ago and would have loved to have had the support of an organization like IRIS," Lee said. "I'll keep on doing it. Each gown takes 45 minutes to a hour to make. The smaller ones actually take longer than the larger ones to make." Lee, who works for Professional Suppliers in Faribault, decided to use her sewing talents for what she believes is a very good cause. "We give out between 600 to 1,000 burial packages each year," Sundwall said. "That's really more early loss of infants than some people realize happens." IRIS volunteers are preparing for the organization's fifth annual golf tournament fundraiser, scheduled for 1 p.m. Friday, July 21, at the Faribault Golf Club. "It's great that we have volunteers like Anna Kincade and Sherry Lee who sews burial gowns. But we have many other expenses, and estimate that our costs are around $500 for each family we serve, even with our many volunteers," Sundwall said. "That's why we need to do fundraisers like the golf tournament." Kincade has been crocheting and knitting blankets for six years for burial packages. 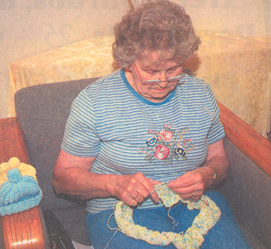 "I've been a widow for 13 years, and knitting and crocheting gives me something to fill my time with. But I've been crocheting and knitting for about 40 years. My aunt taught me to crochet, but I'm a self-taught knitter. It's a hobby I enjoy," she said. "It's got to be a hard thing to lose an infant. ... I don't think so much about how sad it is when I make a blanket but just how the blanket is going to help the parents feel better," Kincade said.